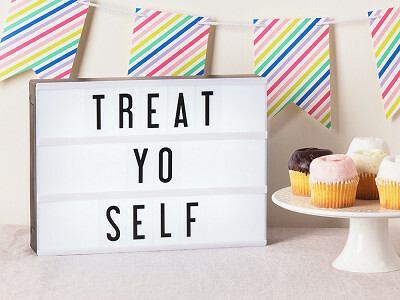 This customizable marquee lightbox will never look the same. Change it to suit your mood, set a reminder, add a quote, or showcase your favorite movie title. Makers Andrew Papraki and Andrea Banyai’s wanted to create a sign reminiscent of the old school movie marquees—that each of us could change as often as we like. Display your brilliant ideas by sliding the bold type through the rails. 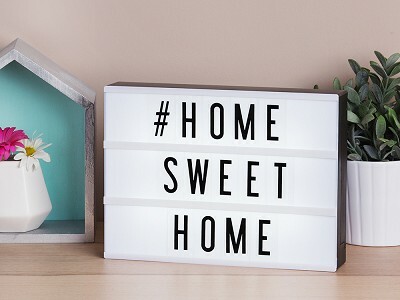 The black font stands out sharply against the bright light, adding a retro vibe to any room in the house. 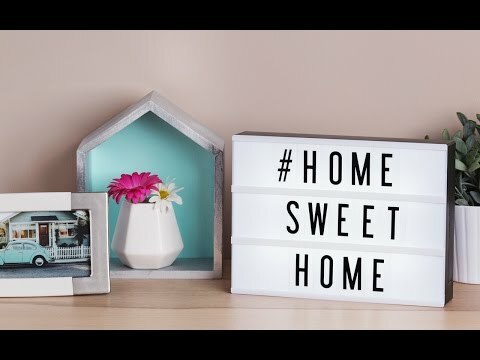 My Cinema Lightbox lets you decide what’s featured on the big screen—whether it’s words to your favorite song or a cheerful note to your family. Hello everyone! I'm proud to introduce My Cinema Lightbox to The Grommet. I'd be happy to answer any questions you have! Andrea, what mechanism is used for on/off functionality. 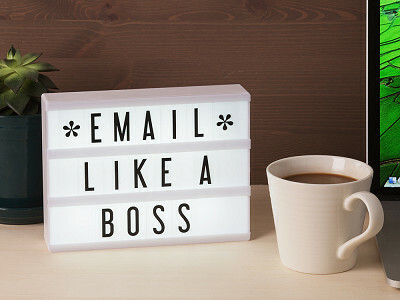 I'd like to put this on my desk and have it read "On The Phone!" and have an easy way to turn it on and off. Is there an in-line power-switch like on some lamps or a button near the marquee? @Ryan Hi Ryan, yes there is a simple on/off switch on the side! It can be powered be either batteries (making it cordless) or the included micro USB cable. The USB cable slot is above the on/off switch. What is the light source inside? @HALEY We use a low voltage LED light. These lights never wear out so you don't have to worry about replacing them! Will the mini marquee ever offer an extra symbol and letter pack in black? I prefer the traditional, clean lines of black on white. 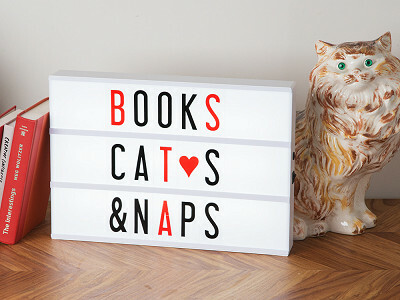 This customizable marquee lightbox will never look the same. Change it to suit your mood, set a reminder, add a quote, or showcase your favorite movie title. Makers Andrew Papraki and Andrea Banyai’s wanted to create a sign reminiscent of the old school movie marquees—that each of us could change as often as we like. Display your brilliant ideas by sliding the bold type through the rails. 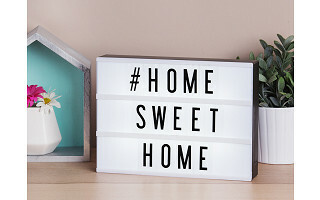 The black font stands out sharply against the bright light, adding a retro vibe to any room in the house.